This one is about dyeing goofs, repeats, and surprises. My brain starts thinking about and planning the next warp while I’m working on the one currently on the loom. 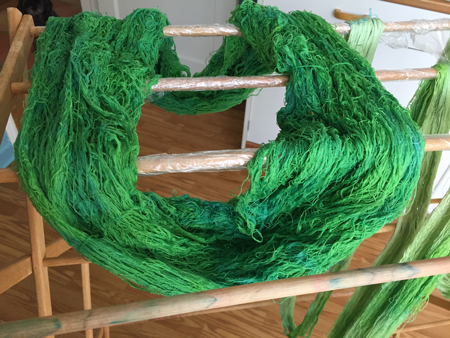 I knew I needed to weave with silk, and I needed scarves, so I figured I’d do some silk dyeing. I wanted to use my shower curtains as my inspiration – they are dark to light teal. 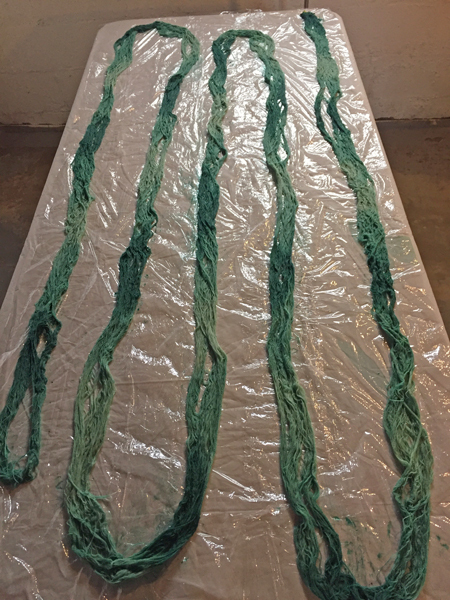 So I measured out some 30/2 silk the warp for 3 fringed scarves, and also decided to dye a skein in a darker shade for weft. 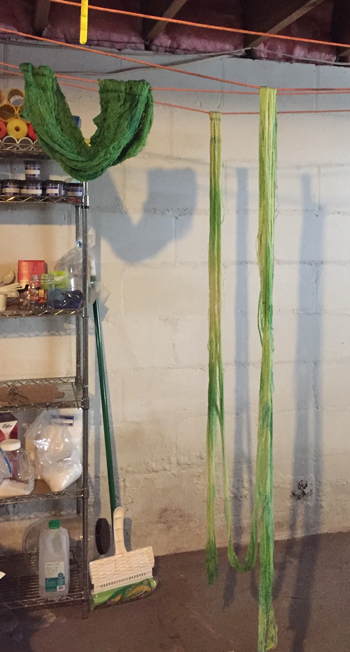 Then down to the basement with my notes from earlier dyeing. I hand painted the warp. It was clear that the blue-ness was virtually all gone, even while I was painting. 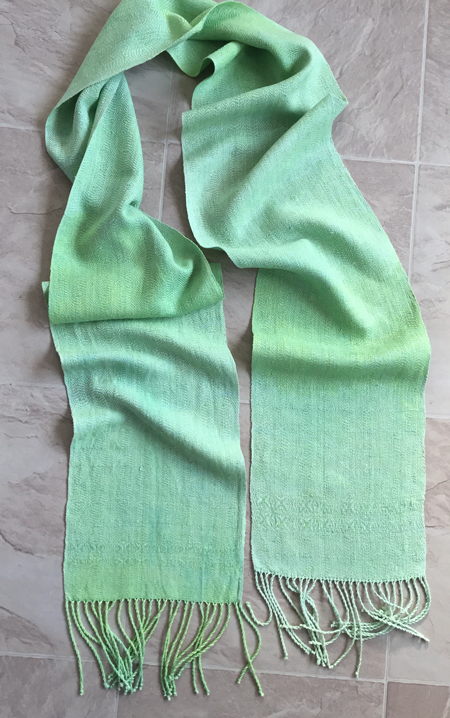 This natural silk had quite a yellow cast, so it reacted with the dye and everything was shades of green. Ok, I can live with that. I decided that instead of immersion dyeing the skein, I’d paint it, all the same color. Much quicker. I wrapped them up and brought them upstairs to batch overnight. The next morning it was back down to the basement for rinsing and soaking. Wait – what?! I unwrapped the skein first, and the color was POURING off it. Why?? Oh crap! I hadn’t dyed silk in quite a while, and forgot that silk MUST be steamed. So. What to do now? How to resolve this? 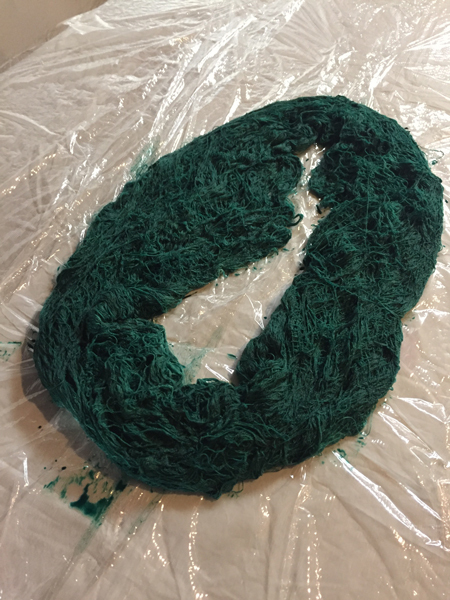 I set the skein in a soda ash presoak (which I later had to dump as so much dye came off the skein), mixed up more dye, re-painted and re-wrapped it. Then I took the skein and the warp upstairs and steamed them both. Now for another day and night of batching. The following morning it was back down to the basement to unwrap and soak. 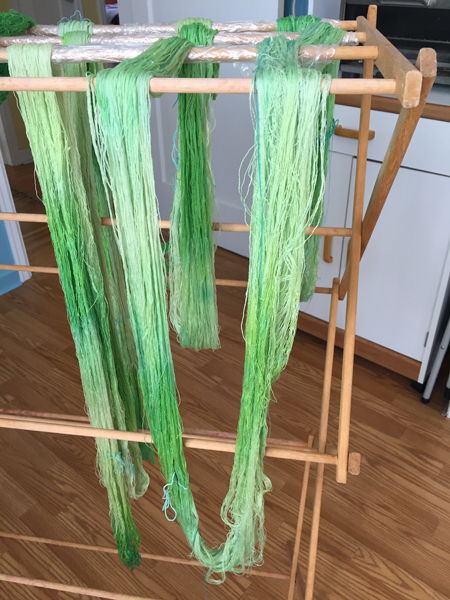 After soaking for several hours and more rinsing, I was surprised at how much dye STILL left both the warp and weft yarns. Here they are hung in the basement, dripping wet. Once they’d stopped dripping, I brought them upstairs to finish drying, as it takes too long in my unheated basement. Although much paler than anticipated, I liked the fresh, spring green. Once both warp and weft were dry, however, they were both MUCH lighter still. Oh well, I wasn’t going to dye them both again. So I warped the loom and started weaving. The weft color was so similar to the warp colors that the weave pattern was almost indistinguishable. I went with an easier treadling for most of the scarf, with just the complex pattern near the ends of the scarf. I sure didn’t want to use that weft for another scarf and don’t have more 30/2 silk, so I switched to 20/2 blue silk for the second scarf. 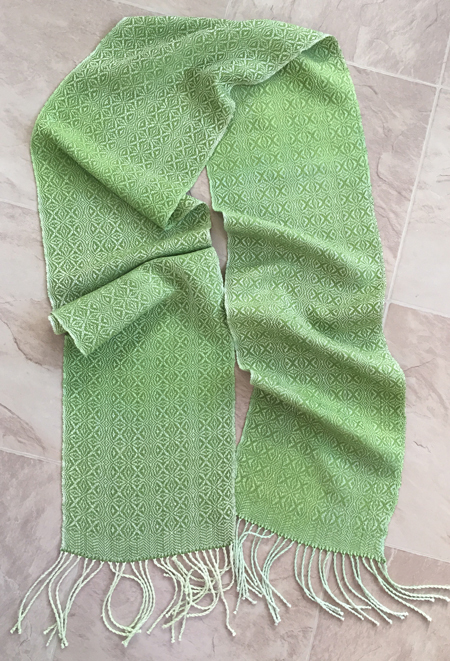 For the last scarf I used some green cashmere-silk I’ve had for quite a while. It’s so fine I used it doubled. 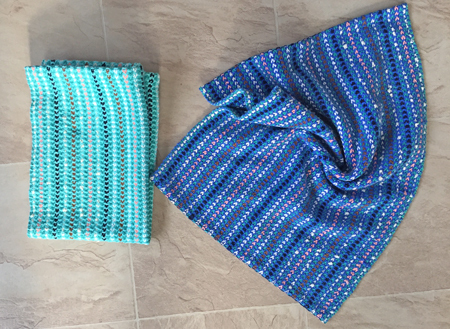 Unrelated…I also wove 8 towels this month. Sticking with my ‘must use stash’ mantra, I warped the loom with lots of mini-cones of vintage cotton rick rack yarn for bumberet. This yarn was roughly the size of 3/2 cotton. Because I didn’t want a warp-faced fabric, I gave some thought to what my choices were for weft. 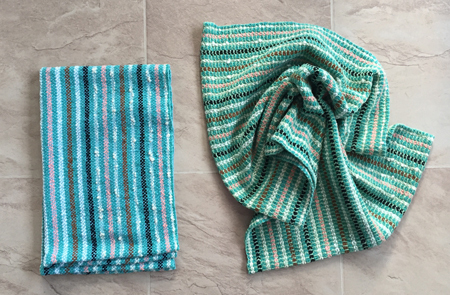 For the first 2 towels I used aquamarine 8/2 cotton, doubled. I wove the next 2 with peacock cotton, again 8/2 doubled. I looked around at my bins. What else did I have hanging around that might work? 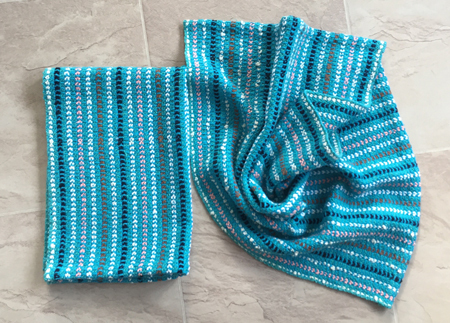 I picked some Sugar & Cream yarn, first in a dark-ish blue, then in a light aqua. These towels are definitely thick, but I believe they’ll be nice and thirsty. Then I picked an odd green 8/2 cotton, again doubled. It’s not my favorite combo, but it’s okay. 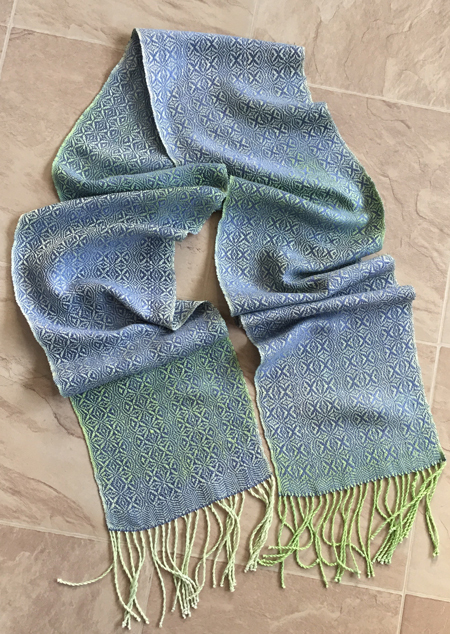 Finally I used a pale blue, going with plain weave for this last towel. I have another handpainted silk warp on the loom now, but that’s another story for next time. Oh, my! Blue it’s not, but your greens are luscious! 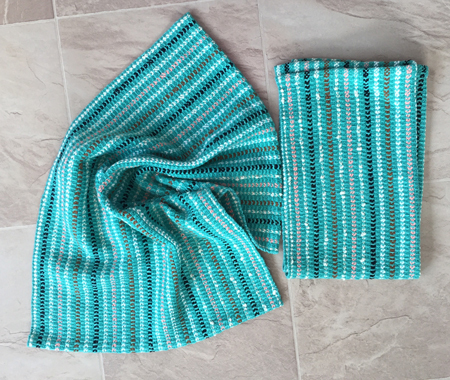 The first scarf is the color of spring, for sure! These are even more gorgeous in person!